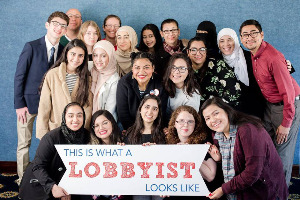 FCNL’s Spring Lobby Weekend is an annual advocacy event for students, and this year, this exciting event takes place in Washington, DC March 23-26, 2019. This March we will be revisiting our immigration work started at last year’s event, and we are excited to welcome 450 young adults to Washington, DC to tell their stories and make their voices heard! This event will include three days of lobby trainings and speakers followed by one day of lobbying on Capitol Hill. If you have any questions or are interested in recruiting young adults in your area, please contact Larissa@fcnl.org. Minute endorsement of the reduction in projected Pentagon spending and the preservation of federal budgets which support the peaceful prevention of deadly conflict and other human needs. Encourage Friends to communicate their support for these priorities to the public and to Congress. Encourage Friends within the Meeting to contact their elected members of Congress to report this message. A unique feature of the Friends Committee on National Legislation is our practice of involving as many Quaker meetings, churches, and other groups of Friends as possible in shaping priorities for the lobbying efforts that we undertake together. The priorities process guides all of us in FCNL in focusing our legislative work for the next two-year session of Congress. We urge you to involve your group in the process of setting priorities for FCNL’s lobbying work for the 113th Congress (2013-2014) by meeting together to discern and record the issues most important to you. Many gatherings have joyously reported on the spiritual depth and sense of engagement they have found through this process. Your participation is essential. Please send us—no later than April 16—up to five priorities that your church or meeting or gathering discerns should be a focus of FCNL’s work in the 113th congressional session. We strongly prefer that you submit your responses online at fcnl.org/113priorities, because it is so much easier for committee members and staff to receive and review electronic responses. If that is not workable for you, you may send your input to FCNL in another form, as outlined in the instructions. Hearing from the wider Quaker community is fundamental to our work. We greatly appreciate the time you are taking to read these materials and to gather together for discernment, and we eagerly await your response. Should you have questions, feel free to contact Policy Committee members Marge Hannon Pifer (pifermh@tds.net) or Jim Matlack (jmatlack@roadrunner.com). Former Policy Committee member Welling Hall has also offered to advise (wellingh@earlham.edu).